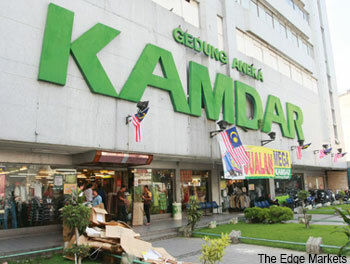 KUALA LUMPUR (Oct 14): Kamdar Sdn Bhd, a wholly-owned subsidiary of Kamdar Group (M) Bhd, is suing its former chairman Bipinchandra Balvantrai, Jayesh R Kamdar Rajnikant and contractor Yap Kim Hong for allegedly withdrawing funds totalling RM8.7 million from the company. It is also seeking to claim general, aggravated and exemplary damages, compound interest and such further and other relief as the court deems fit. In a filing with Bursa Malaysia today, Kamdar Group said Kamdar Sdn Bhd had filed the writ of summons together with statement of claims through the Kuala Lumpur High Court on Oct 3. “On Oct 9, Kamdar Sdn Bhd, via its solicitors Messrs Amrit & Co, has served the same to the three defendants to initiate proceedings,” it added. At 12.30 pm, Kamdar Group shares were unchanged at 62 sen, with a market capitalisation of RM122.75 million.